Some say that some of them had been sunk into the Austrian Mondsee, others maintain that they were flown to South America or brought there in parts. It is certain though that if the crafts didn't get to South America, the plans that did allowed for new ones to be built and flown there, for an important part had been used in 1983 in the "Phoenix Project", the follow-on project of the 1943 "Philadelphia Experiment". This was a teleportation, materialization and time travel experiment of the U.S. Navy that was more successful than you could imagine in your wildest dreams. There is enough material for another book, but it does not fit too well into our subject here. See the literature list. In 1938 a German expedition to the ANTARCTIC was made with the aircraft carrier Schwabenland (Swabia). 600,000 km2 of an ice-free area with lakes and mountains were declared German territory, the "NEUSCHWABENLAND" (New Swabia). Whole fleets of submarines of the 21 and 23 series were later headed towards Neuschwabenland. Perhaps some may think these assumptions to be a bit on the daring side, but there are strong indications that this may well have happened that way. (For example the video-production UFO-SECRETS OF THE THIRD REICH - which so clear shows the story here - why is this production never shown in our traditional tv-stations?? Because it shows the whole secret - and why the americans after ww2 had to secure this information for their own increasing of power and PREVENT THIS INFORMATION TO REACH OUT - THIS WOULD SABOTAGE THEIR CONTROL OF THE WORLD THROUGH MONEY AND ENERGY CONTROL). 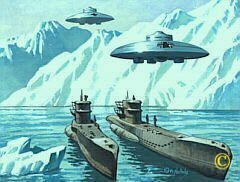 There is the question why in 1947 ADMIRAL E. BYRD led an invasion of the ANTARCTIC, why he had 4,000 soldiers, a man-of-war, a fully equipped aircraft carrier and a functioning supply system at his command if it was a mere expedition? He had been given eight months for the exercise, but they had to stop after eight weeks and high losses of planes undisclosed even today. What had happened? "It is the bitter reality that in the case of a new war one had to expect attacks by planes that could fly from Pole to Pole." Further he added that there was an advanced civilization down there that used their excellent technologies together with the SS. One year later, in 1946, the many sightings that suddenly occurred in Scandinavia of shining objects of unknown and definitely artificial origin caused a great stir among the Allies in East and West. Again one year later, in 1947, and well into the Fifties, a rising number of shining unknown flying objects, doubtlessly steered by intelligent beings, mostly round, disk- or bell-shaped, sometimes cigar-shaped, so-called UFOs appeared over North America." The flying machines just mentioned are well documented on photographs and films. There is the 60 minutes documentary "UFO - Secrets of the Third Reich". The American Vladimir Terziski gave a three-hour speech at the September 1991 UFO conference in Phoenix, Arizona, where he showed slides of German saucers, construction plans and subterranean German bases. Also of interest are the book by the Italian air force commander Renato Vesco and the book by Rudolf Lusar "Die deutschen Waffen und Geheimwaffen des Zweiten Weltkrieges und ihre Weiterentwicklung" (The German Arms and Secret Weapons of the Second World War and Their Development), J. F. Lehmanns Verlag, Munich 1971. But these exist in America, and in large numbers. For around the same time the Americans recorded quite a number of crashes that could not be kept entirely secret. More of that later. Back to the political arena. Apart from the fact that I. G. Farben supported Hitler, their cartel partner "Standard Oil" (Rockefeller) fanned the flames against the Nazis. The "Ford Motor Company" for instance helped to build up the American army while at the same time producing in Germany military vehicles for the Nazis. Ford and Opel (subsidiary of General Motors that is controlled by J. P. Morgan) were the two largest producers of tanks in Hitler's Germany. One of the reasons is that the Rockefeller Foundation spent US$ 139,000 in 1946 to present an official history of the Second World War which covered up the whole story of the U.S. bankers building up the Nazi regime as well as the occult and mystical background of the Nazis. One of the main sponsors was Rockefeller's own "Standard Oil Corp."
SECRET SOCIETIES (as this is extract from) of Jan van Helsing (pseudonym) as audiobook mp3 - 38parts a 30min.